1983: Tamadam Bonded Warehouse Sdn Bhd was founded by Yang Mulia Dato’ Seri Tunku Mahmud bin Tunku Besar Burhanuddin. The company is engaged in the business of providing bonded warehousing, freight forwarding and transportation services. 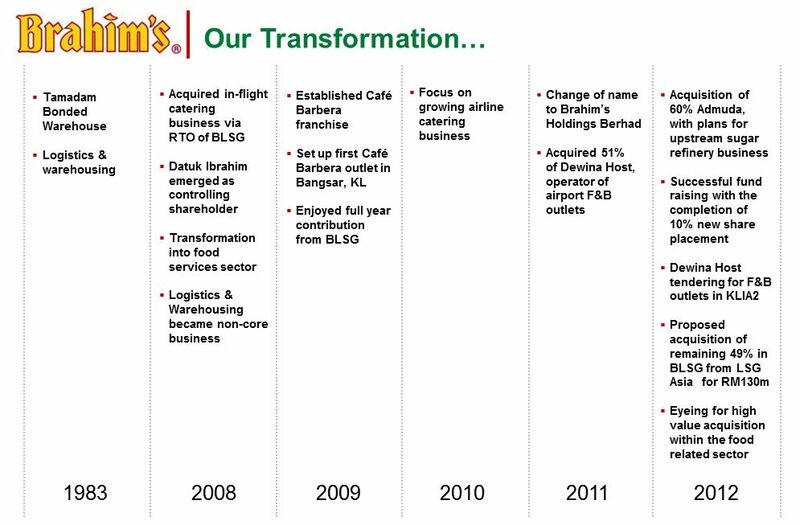 2008: Acquisition of 51% of Brahim’s – LSG Sky Chefs Holdings Sdn Bhd for RM130 million. With the completion of the acquisition, the Group’s new core business is focused on food services. 2009: Ventured into Cafè Barbera franchise with licensing rights for Malaysia, Singapore and Indonesia. Founded in 1870, Barbera Caffè S.p.A., based in Naples, Italy offers world-class Italian gastro-culinary fare. 2010: Memorandum of Understanding between LSG Sky Chefs-Brahim’s Sdn Bhd and Halal Industry Development Corporation Sdn Bhd. The food services division achieved a robust result of 97% of the Group’s revenue. LSGB served up to 36 airlines with a total output of about 50,000 meals per day and is the world’s biggest halal flight kitchen and garnered multi-winning awards for quality and excellence. 2011: Completed acquisition of 51% equity interest in Dewina Host Sdn Bhd for a cash consideration of RM20.0 million. Change of name from Tamadam Bonded Warehouse Berhad to Brahim’s Holdings Berhad with effect from 1 June 2011. Commenced divestment of Tamadam 2.